This church is mentioned in historical texts as far back as 1032, which means that it was built before that year. While the exact date is not known, the consensus is that it was built around the year 1000, maybe earlier. Standing inside of something that is more than a thousand years old was hard to grasp. 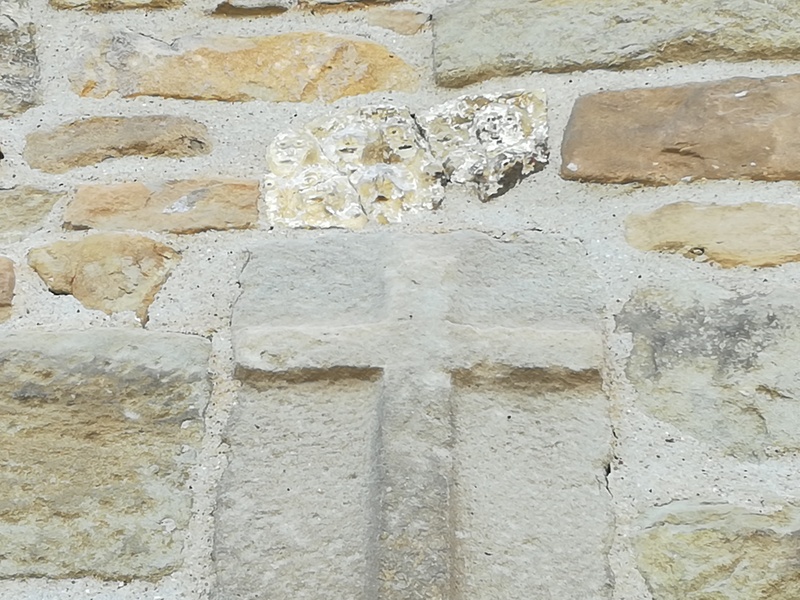 The church had very little architectural decoration, but the primitive looking carved faces above one door have left the historians scratching their heads. Not too far after the church, the pretty village of Bourdoux provided a quick coffee break. 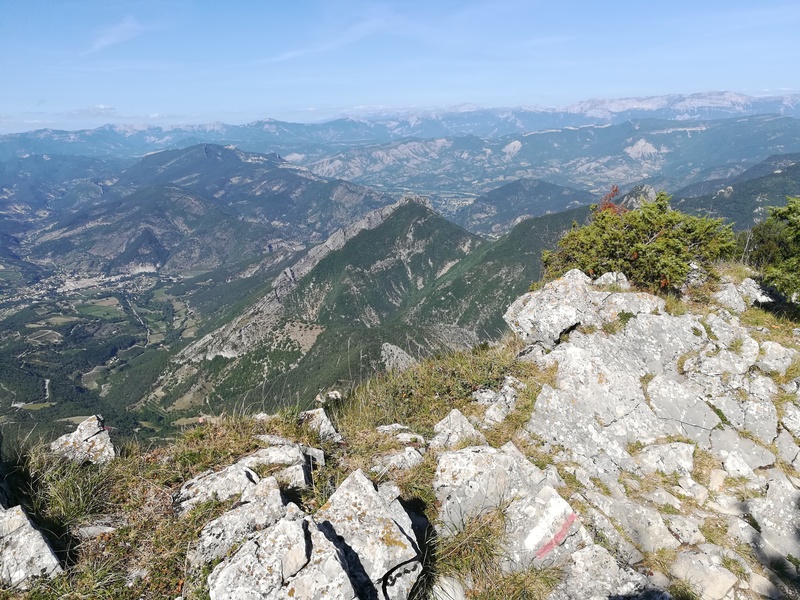 The intense climbing that followed took me to the top of a ridge that had a vertical cliff face with views over the Rhone Alpes and the village of Saillans. It was a breathtaking view, but the trail running right next to the cliff edge was making me nervous. I was looking down on Saillans below thinking about how far away it looked, and how steep the climb down would be. 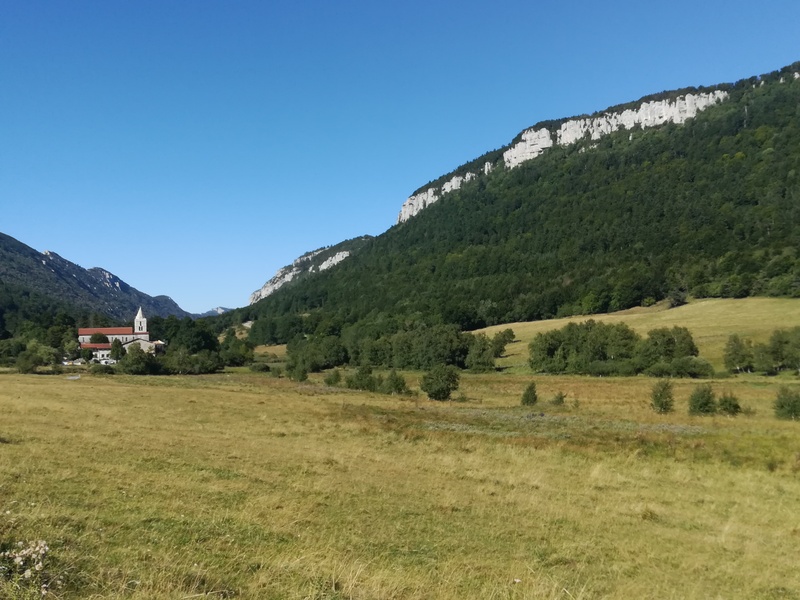 After a long day and a stiff downhill jaunt, I arrived in Saillans and stayed at the campground just outside of the village. The second day was closer to 40km, but there were no tough climbs, just some ups and downs through the forest and valleys. 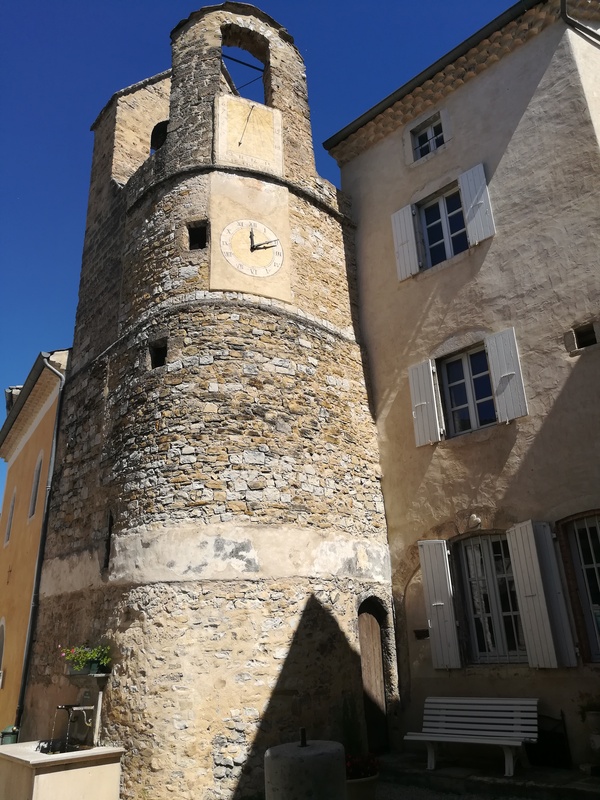 My lunch break was the village of Beaufort sur Gervanne, with its interesting rotund church tower. 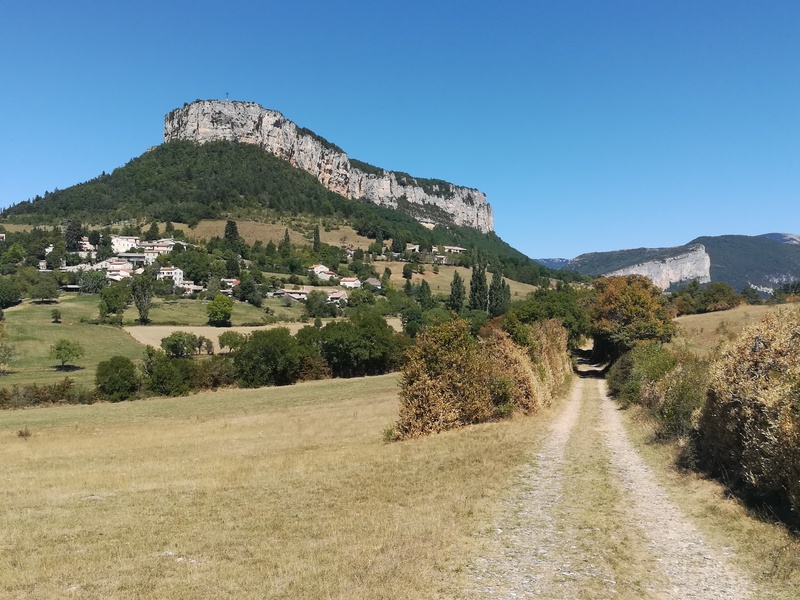 This was followed by the dramatic entrance to the otherwise sleepy village of Plan de Baix, with the overhead sombrero-shaped cliff. I was able to find accommodation in Leoncel that night. Leoncel was tiny, with only a few buildings. 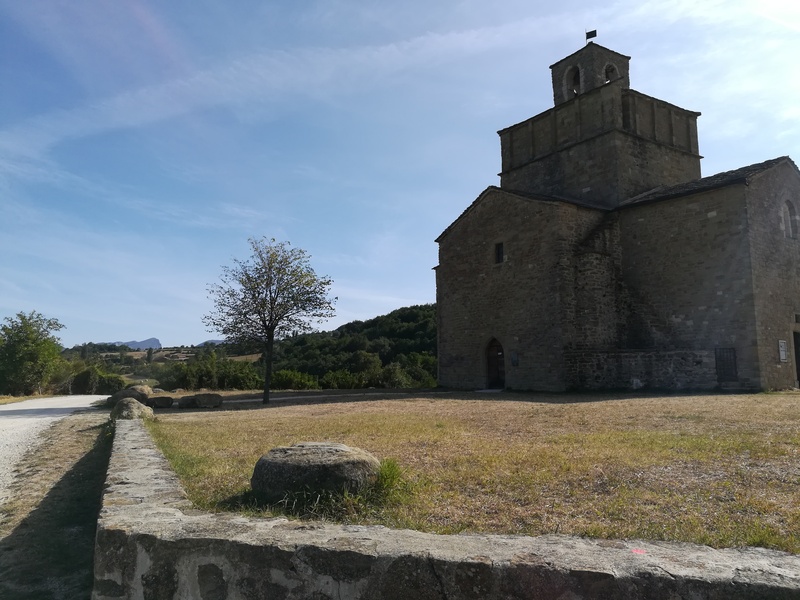 But, the centerpiece was the 900 year old Abbaye de Leoncel, which had a simple architecture but was beautiful as it sat on the floor of the green valley. The day after Leoncel wasn’t quite as exciting, but still had some nice landscapes. The valley narrowed and the cliffs turned into some sharp spines as the trail followed the creek and passed through some excellent looking forests before arriving in Bouvante. 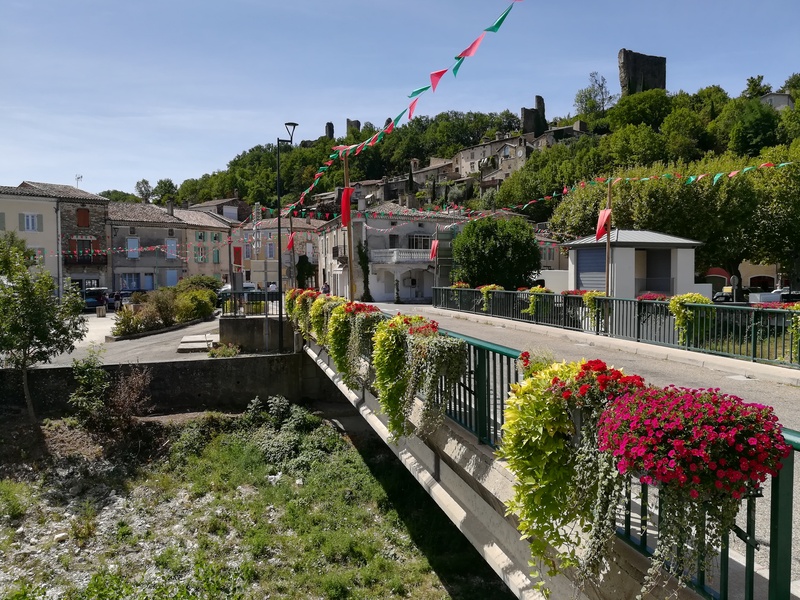 Bouvante was quiet, but a good spot to stop for a water refill before the long last leg of the day into Saint Laurent en Royans. After some sections of forests with large trees, the path followed a paved road for quite some time before making the hard and rocky drop through the cliffs into town. Saint Laurent en Royans wasn’t particularly attractive and was largely newer buildings, but it was a good stopping point considering that I was exhausted from a string of longer days. The next day was both spectacular and exhausting. 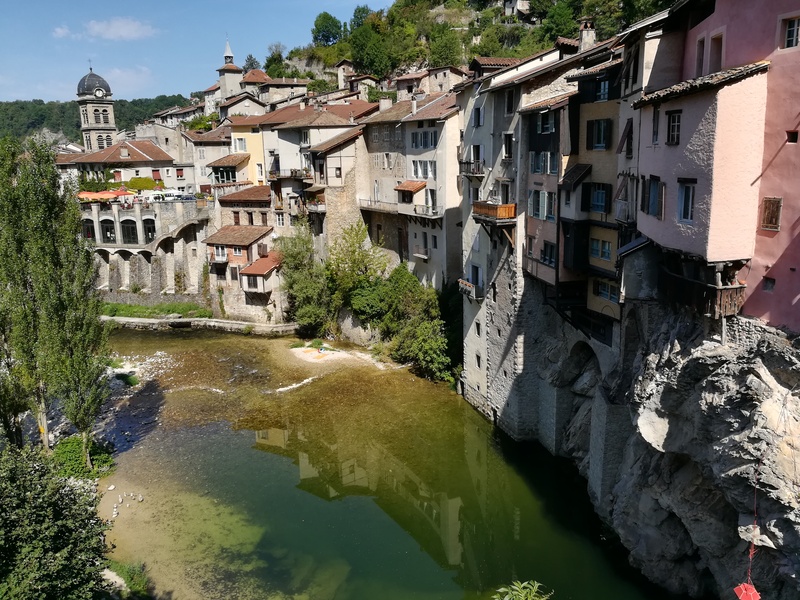 A few kilometers from Saint Laurent en Royans was the utterly amazing village of Pont en Royans, which was situated at the mouth of a gorge. The village was built atop the rock wall next to the river, and was one of the most unique and beautiful places I have seen. The path then followed the river gorge before a very difficult climb, trudging up the hillside to a cliff before it passed through a small opening in the cliff face. Though this climb was difficult, the views were stellar. I could see across to the other side of the gorge, where some villages were perched above the cliffs. 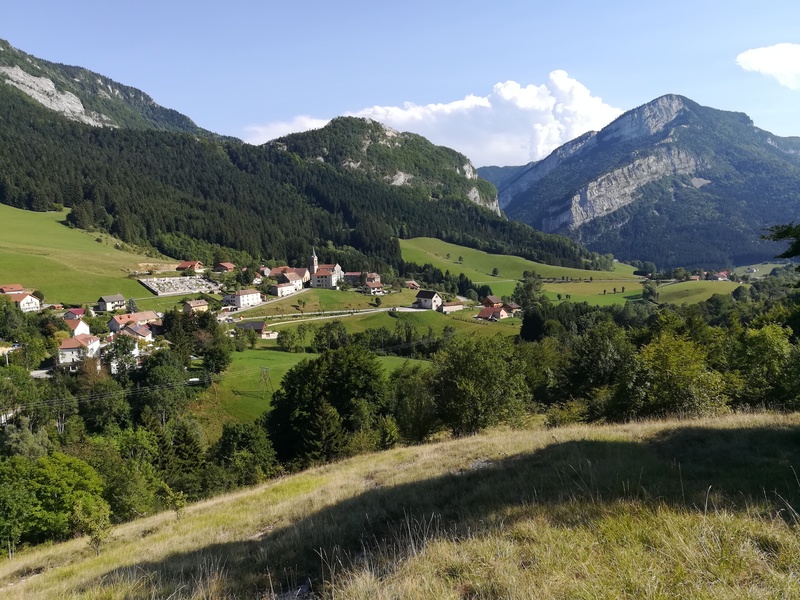 The walk across the hilltops above the gorge culminated in the scenic arrival into Rencurel, a classic view of a mountain village near the Alps. The next day was finally a bit shorter, allowing me to rest a bit while still getting in some distance. I passed over the range near Rencurel to the neighboring valley and the ski town of Autrans. The weather was not very good. It was humid with periodic showers, but at least it was a shorter day. 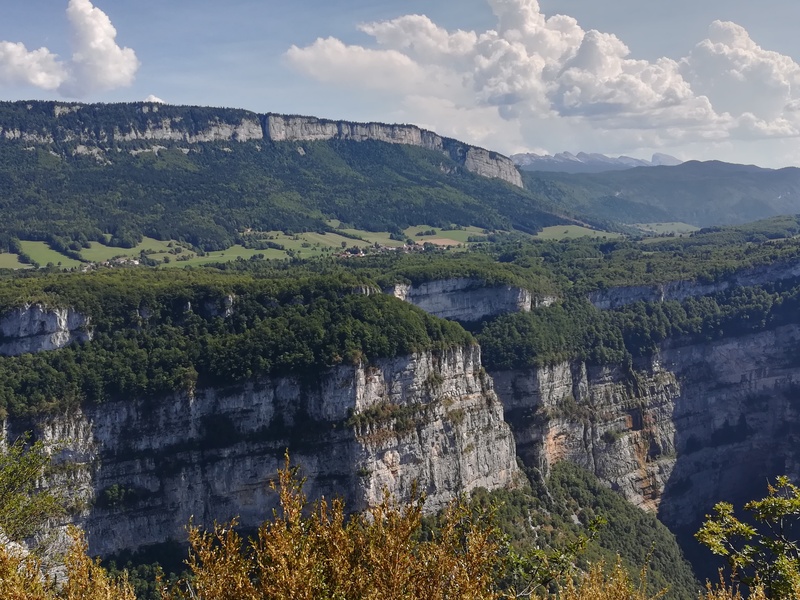 Autrans is only a short drive from Grenoble and acts as a base for skiing, mountain biking, hiking, snowshoeing, cross country skiing, and other fun stuff, so it was pretty busy for its size. When leaving Autrans on the flat valley roads, I was passed by groups of cross country skiers that were training with their summer roller skis. I then left the valley floor for the ridgeline above the ski lifts, which had some amazing but nerve-wracking views towards Grenoble. The trail ran right along the edge of a cliff, and it was a long way down. 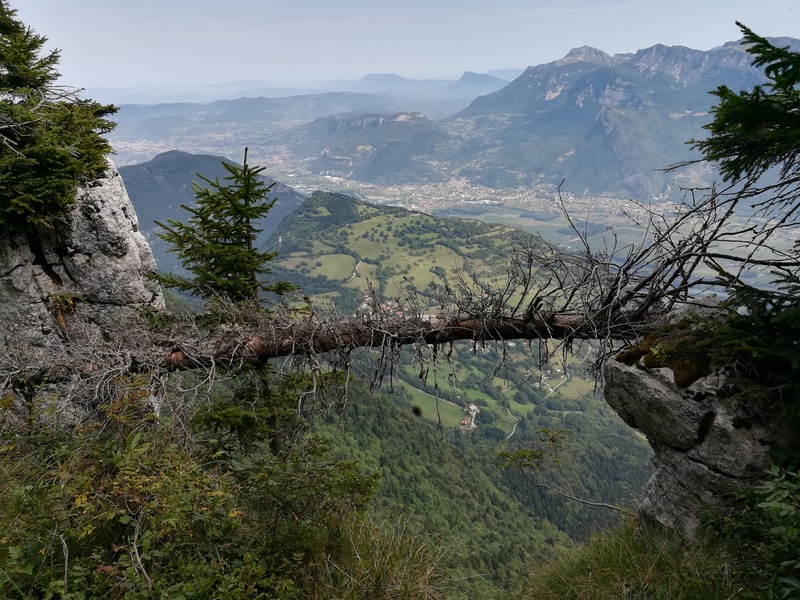 It took a while to get out of the high mountains and through the foothills and suburbs of Grenoble, but it was nice to have some bustling city life again. A good opportunity for a rest day, a haircut, and shoe shopping to find the replacement for my soon-to-be-finished shoes.